Note: This post contains some affiliate links. All opinions are my own. 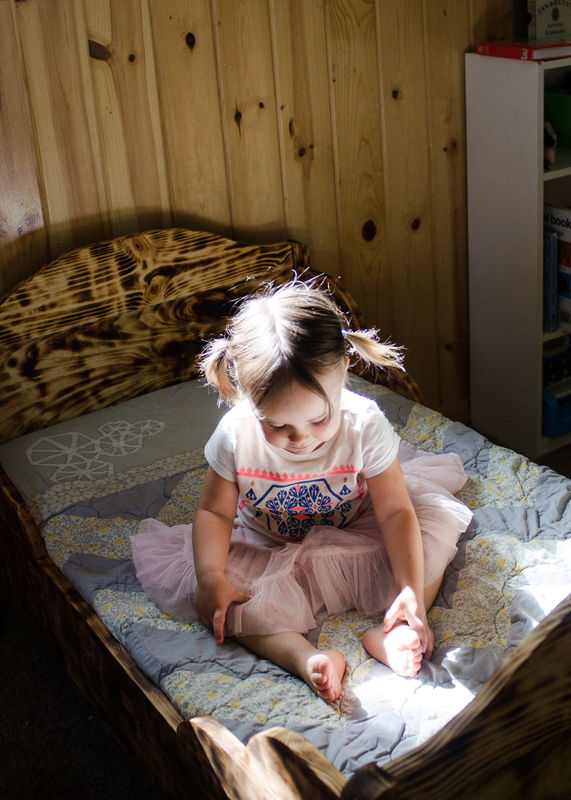 This toddler bed has been a long time coming. 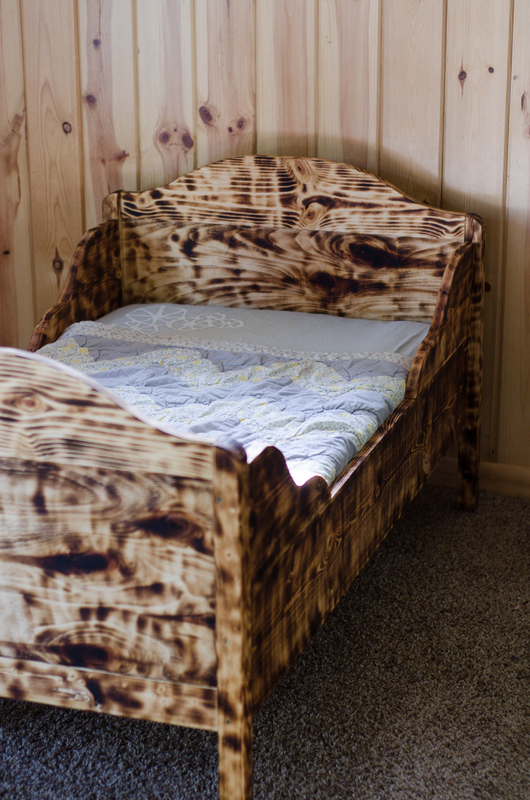 Reuben and I have been wanting to try our hand at homemade furniture for a while, and we decided to start with a toddler bed. 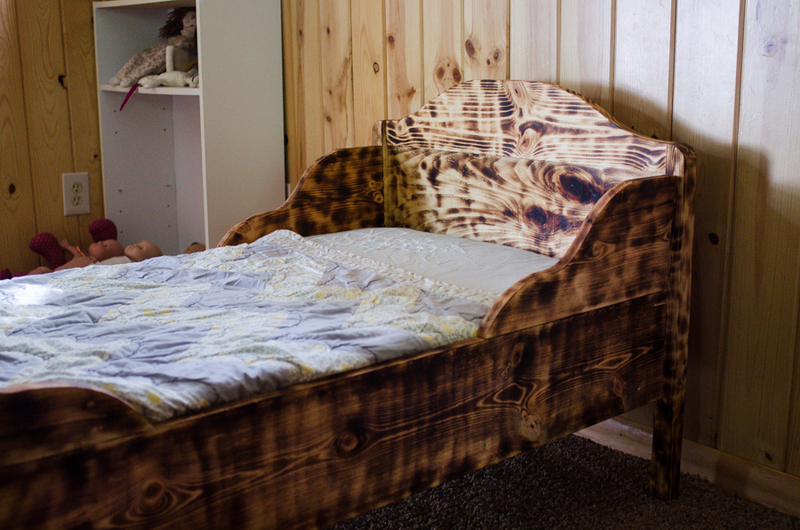 This spring we purchased some lumber and slowly began working on the bed. I knew I didn't want to use any chemical-filled stains or varnishes, so I researched some natural options. 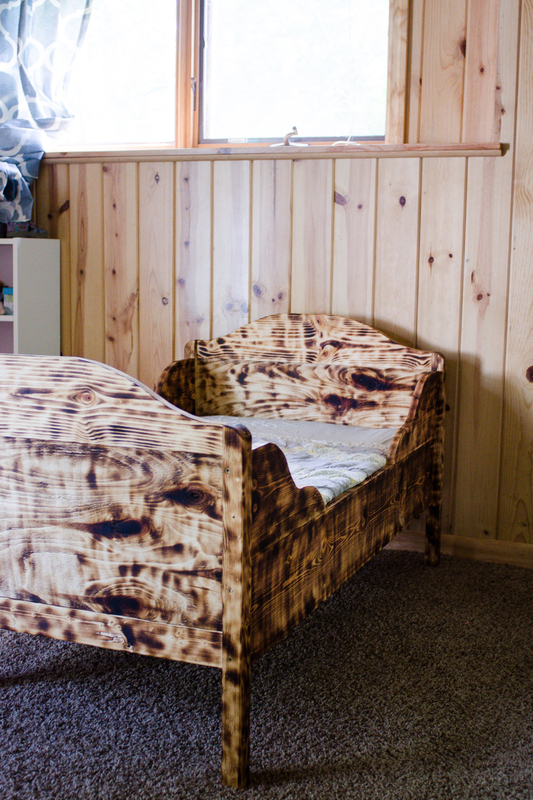 Reuben's mom and dad suggested that we could burn the surface of the wood to darken it, and use tung oil to seal it. We tested it on a small piece of wood, and decided to go for it. So, after a lot of sanding, burning with a blowtorch, and finishing with tung oil, we were finally ready to screw everything together. I use "we" loosely, since Reuben did all of the piecing together. But I was moral support! I am very pleased with the results, and now I want to try my hand at more furniture-making. We are in desperate need of a bookshelf, and I'd like to make a little table for Helen. Darling! I like the results of the of the burning---so unique! 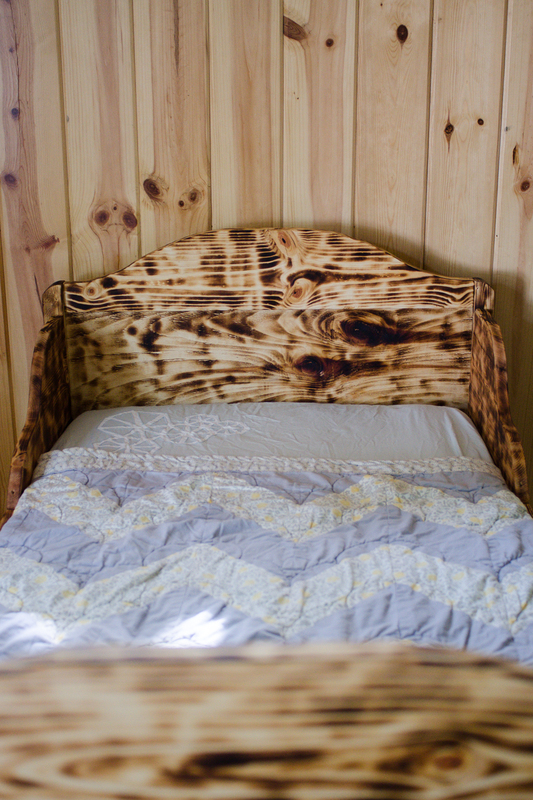 What a pretty bed! I love the design and look of the wood - its very unique. 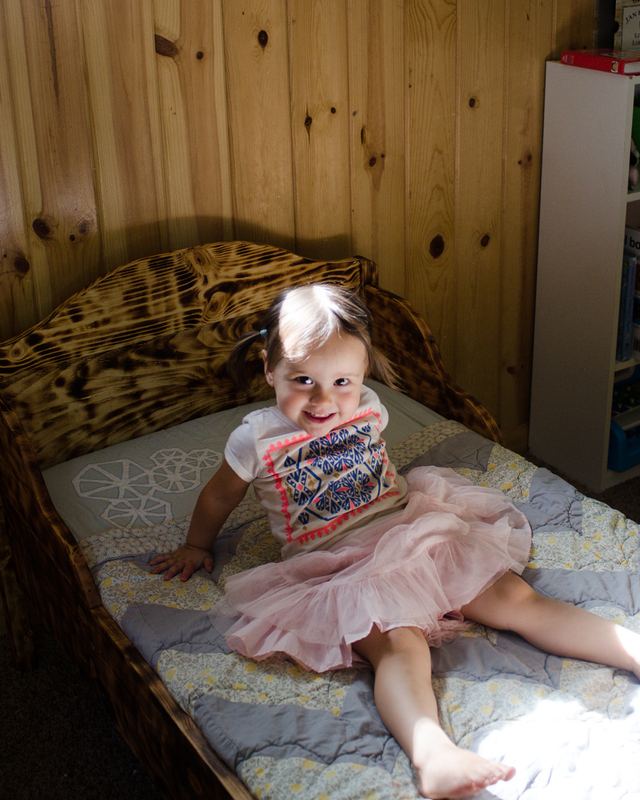 We also have two crib mattresses (one crib converted to a toddler bed), and will probably have to get one twin next summer when #3 is big enough to need one of the cribs. I'm a little nervous about that purchase! 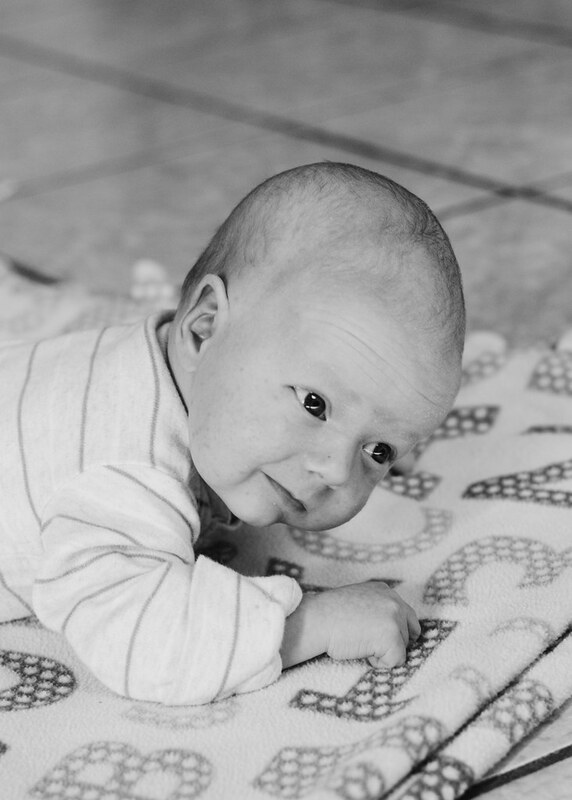 We've been able to swing it for the organic crib mattresses though. Organic Grace is a website that carries several popular brands, and their own simple wool-covered latex mattress is by far the most affordable one I've seen out there that is truly organic. We love it!